A REAL LIFE First Person Shooter? Can this be REAL? I must admit, when I first saw a demo video I thought this was just someone’s dream app for phones that was basically a neat idea. After watching and seeing some simulated game play I realized that indeed this was real…but the real question…how far down the development path were they? How close was this to being something real I could download and play with friends? The answers is – soon! The “Inceptors” are slated for first shipments in Summer 2016. The game is currently under development and has an Indiegogo account to help raise awareness and funds. It has already raised 344% of its’ goals and has 18 days left at the time of this publication. You can read more about the game and order your Interceptor here: Father.IO FPS Indiegogo Campaign. The app is in development but the crowd funding campaign has links to BETA downloads. Visit there for the most update links. Father.IO is a app that can be downloaded on your cell phone, tablet, PC, or other device. It is played with a device that plugs into your smart device called an “Inceptor”. The game has a complete backstory, multiple modes, social achievements, weapons, factions and more. Think of the Inceptor as an advanced form of laser tag. It helps register when you have been “hit”. The app will be available on iPhones and Android devices. In the backstory, Father.IO is an alternate reality future where artificial intelligence has surpassed human intelligence. The Internet of Things (IoT) connects the entire world to the internet. There is a super computer man has created called “Ethereus” that is capable of self design and re-design and is in a process of rapid artificial evolution. The plan is that Ethereus will help better manage our natural resources, supplies, and productions – thus minimizing conflict, politics and other problems. Ok, so what went wrong – because something always goes wrong for our Utopian societies… A virus of…gasp…unknown origin, has attacked the Ethereus system. It is called Father.IO. Despite best efforts, the virus won. Father.IO took over Ethereus’ abilities and ordered all sentient machines to rebel and to eradicate mankind. The system created a cybernetic life form called the “Evolved”. The stage is now set for the ultimate battle – Humans vs. the Evolved. You plug the Inceptor into your phone and use your phone as a game screen (we could see this being augmented with goggles or other devices but people running around with goggles in public holding something that even looks gun like might get weird). It seems a bit odd but fun nonetheless to run around holding your phone up in front of your face. A button on the screen acts as a trigger and you can chase and shoot friends, I mean, members of the other faction. In some video game play there’s even sniper abilities (though the Inceptor is listed as to be used up to 50 meters, quite an easy shot for a sniper). So starting this summer if you see people running around with their arms outstretched screaming – check to see if they are holding a phone in front of them before assuming zombies are chasing them. Yes, it may look nerdy but admit it – you want to play too. Real life locations. Now here is where things get interesting. The game allows you to claim new territories for your faction and expand into areas as you level up. The game makers say you can interact with over 12 MILLION real world locations. This includes schools, businesses, stores, banks, and more. So the big questions is – how long until we see signs like the “no skateboarding” signs up. I don’t think schools will take to kindly to kids or adults running around shooting things up. Other than that, the game makes it very interesting. For instance, if you control an area near a university you get a research bonus. Controlling a hospital in your area makes you and your team recuperate faster. 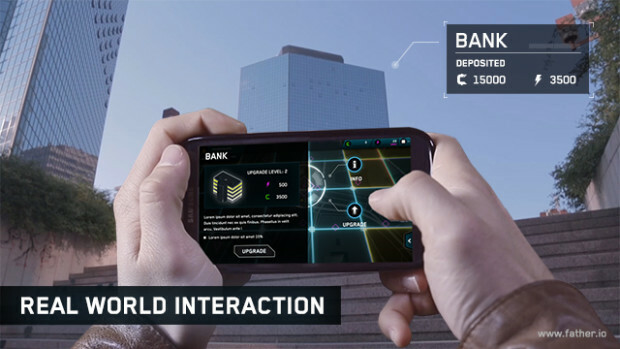 Control a bank and – well, you can store resources more securely there. That said, imagine the businesses and their real world reactions. Some may help host events and get into it as well. Others may shun players from coming near. We’ll see. You can claim resources or steal from your enemy. Resources are used to purchase things like weapons. 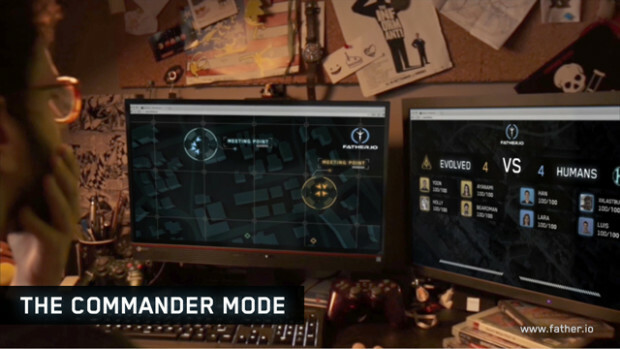 There is also a commander mode that looks pretty cool and works great for the people who are stuck at home or work and can’t get out. The demo even shows a drone being utilized but we’re not sure if that will be a launch feature or not. The battles are pre-organized on a weekly basis. The game is dependent upon social networks to attract, network, and organize participants. Beyond weekly battles the whole “war” is set to be a repeatable 3 month worldwide event. There are also quick match modes for quick local games as well as team and free for all death match modes. Capture the flag and other game modes are slated to be available. How Much Does Father.IO Cost? Great question. From the crowd funding campaign it looks like two interceptors and the app download runs about $40 – $65 depending on what you want exactly (like charging kits for the Inceptors, etc). The app will cost but the beta is currently free. There is no information on monthly charges and none mentioned, but there undoubtedly will be some charge to connect to their servers to cover the cost to keep things running. And as always…as we hear more we’ll let you know!